You’ll never see him coming. Or not. The not-so-top-tier English spy is back on a mission to make some mess and save the world along the way. Surprise! Johnny English is back and get ready to have yourself in stitches! My friends tagged along to United International Pictures’ advanced screening of the movie in Glorietta 3 and man, was this movie HILARIOUS?!? Curious? Finish our review till the end! The G12 summit is just a few days away and as if the Prime Minister is not yet scrambling about it, a major security breach attacked the MI7. All information of their listed spies are now out in the public and a threat, of course, is lying in the distance. With their personal information compromised, they have to trace their last resorts and here comes Johnny English! Let’s be honest here, Bingers. The real hook about Johnny English Strikes Again is not the plot, not the action, but the man himself: Rowan Atkinson. How many of us grew up watching and falling in love with Atkinson’s Mr. Bean? I did! He is practically a personal hero. The man is a comedic icon! And he brings his best trade in Johnny English Strikes Again! Atkinson owned a certain brand of comedy. It isn’t exactly dumb humor but you know he will be making mess along the way and you will just find yourself rolling on the floor laughing, literally! The antics in Johnny English Strikes Again were spot-on! From a VR simulation that got too real to a kitchen accident, everything was hilarious! The humor came out naturally that the whole experience turned out to be a riot! 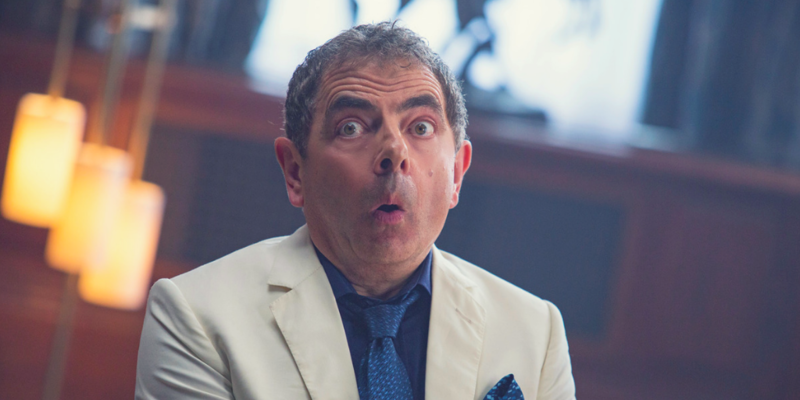 Johnny English Strikes Again is perfect for people who are in need of a good hearty laugh. It is not pretentious nor it tried too hard to be funny. It’s a straightforward approach to comedy with Atkinson’s tested brand of humor. Take this from my experience and my friends’ experience during the advanced screening. Imagine a packed cinema and every other minute roars of laughter will rip through the crowd! The film, if anything else, proves that Rowan Atkinson is truly an icon. Johnny English Strikes Again may have just been the funniest movie that I saw in a while! Binge-level: 3.5 out of 5 stars.